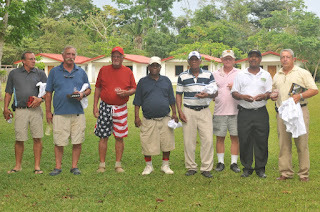 A great day was had by all at the Second Annual Golf World Cup on May 19th 2012 at Roaring River Golf Course. The event was also to raise money. 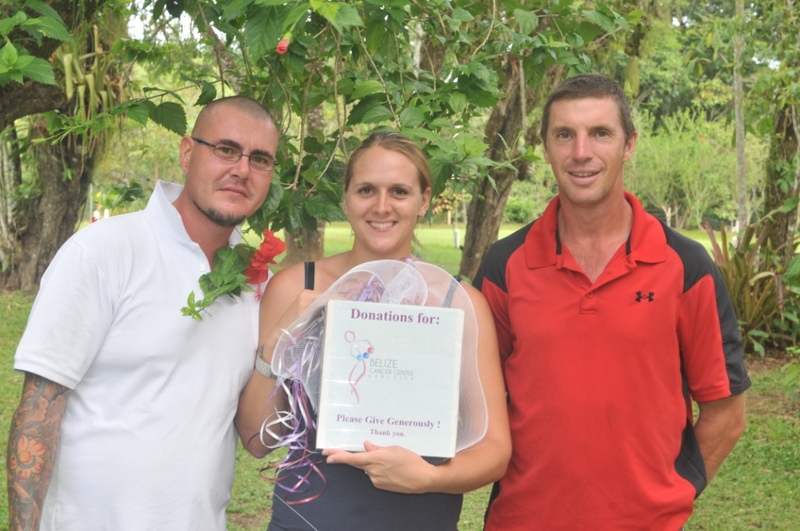 $1,281.00 was collected and will be donated by Corkers Restaurant/Belize Amateur Golf Association to the Dangriga Cancer Society. Thanks to Corkers Restaurant and Bar for sponsoring the event and providing Trophies and a great BBQ lunch. Belizean Americas team triumphed 12 1/2 Pts to 7 1/2 pts. Photo : Tim Heath, Ben Stromberg, Mickey Thornton, Oliver Colon, Ray Garbutt Sr, John Sansone, Bill Mckenzie (Captain), Nelson Gallardo. Also in winning team : Chris Bowling, Steve Maestre, Deacon Cal, Frank Sharpe, Saul Barrera. Graham Mushroom Award - Michel Ardoullie. Bogey King - Tim Heath.